If you own a remote-control gadget or an electric vehicle, your main sources of power come from the battery pack. In short, battery packs are rows of lithium, lead acid, NiCad, or NiMH batteries that are bundled together to achieve maximum voltage. A single battery only has so much capacity – not enough to power a golf cart or hybrid vehicle. Wholesale battery pack manufacturers have processes in place to make sure each battery meets the voltage requirements and is safe for use. If you have a device that requires a high-capacity battery, custom battery pack design is offered by many Chinese manufacturers. What is Battery Pack Assembly? Battery pack assembly is when multiple cylindrical lithium-ion batteries are connected parallelly to form one uniform pack using a nickel strap as the connecting mechanism. Technicians work in a line where they carefully form the pack piece by piece. 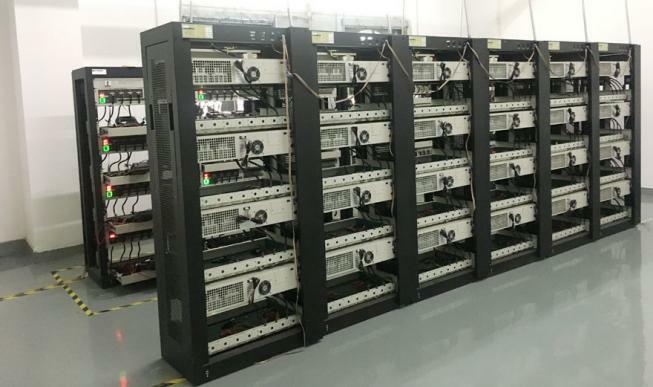 Battery pack manufacturers in China merge the custom lithium batteries into a single unit using either multi-row, face-centered cubic, or an alternating row design. Once the batteries are combined, battery pack assemblers wrap them in heat shrink or another form of covering. What Kind of Team Should the Leading Battery Pack Manufacturers Have? Every manufacturer needs an engineering director to lead the team. The director should have over fifteen years of experience designing battery packs for multiple industries and be familiar with battery pack production for robotics, hybrid vehicles, gardening and power tools, e-bikes, and electric surfboards. A qualified director needs to have a strong knowledge with battery management systems (BMS) design such as SMBUS, R485, CANBUS, and other devices that manage electronic battery systems. There should be a project engineer that works underneath the engineering director. Projects engineers should have ten years of experience in the field and extensive knowledge about nickel strap, lithium metal oxides, the chemical material of each cell, and how to effectively maintain the welding temperature to create the optimum custom battery charge. Lastly, the project engineer for should look for deficiencies in the production process and suggest areas of improvement. The last crucial member of the engineering team is the construction engineer. Like the project engineer, the construction engineer needs at least ten years of experience in the field, especially in the area of designing custom battery casings and moldings. With their molding experience, they should help the production reduce the cost of goods sold (COGS) by eliminating waste and the numbers of errors during manufacturing. Lastly, the construction engineer needs to control the quality of the battery casing achieved through mold injection process. Every battery pack manufacturer needs a QA team to test the li-ion batteries to make sure they meet quality standards. The QA chief needs at least five years of experience of using web-based applications to test both prototype and production models of battery packs. 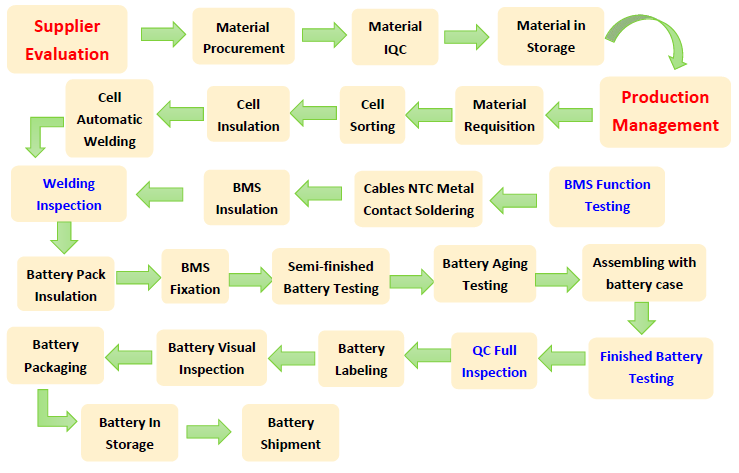 The flowchart above illustrates the production cycle of the TLH battery from procurement of materials all the way to the final testing and shipment of the battery. All custom rechargeable battery packs undergo a full-on QC inspection and a visual inspection to make sure it meets requirements. Lithium-ion pack wholesale manufacturers also inspection the BMS functionality along with the welding job before actually installing the battery pack. From the beginning to the end, each step is crucial to producing high-quality battery packs. The QA team carefully looks at each battery pack and returns them as defective if any problem is found. The longevity of your battery and the capacity depends on the cell brand. For example, Panasonic and Samsung cells have high capacity but come at an additional cost. This is an important component if your device needs a lot of power. If you’re buying an electric motorcycle battery pack or a battery for your power tool, you’ll get a better price the higher your MOQ is. 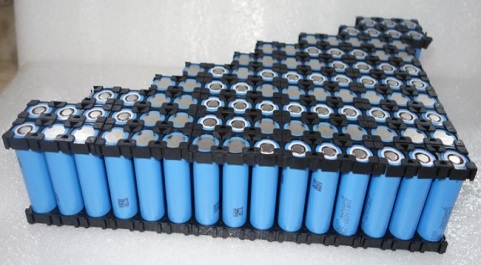 All lithium battery pack wholesale manufacturers offer quantity discounts. You need to thoroughly inspect the design before ordering a battery pack to make sure it will fit in your device. If it doesn’t, the manufacturer should be able to customize it, so it fits perfectly. No matter how much voltage you need to power your tool or vehicle, a trustworthy battery pack manufacturer can meet your needs. Chinese manufacturers are some of the best producers of custom lithium-ion packs along with various other types of batteries. What is the spot weld process of battery pack? Raun 94, 63667 Nidda/Frankfurt am Main Germany. Unit 9 behind Hilton cars 1-3 Uxbridge Road,UB4 0JN United Kingdom.